BE A HERO FOR THOSE WITH AUTISM! Everyone can be a HERO for those with autism! 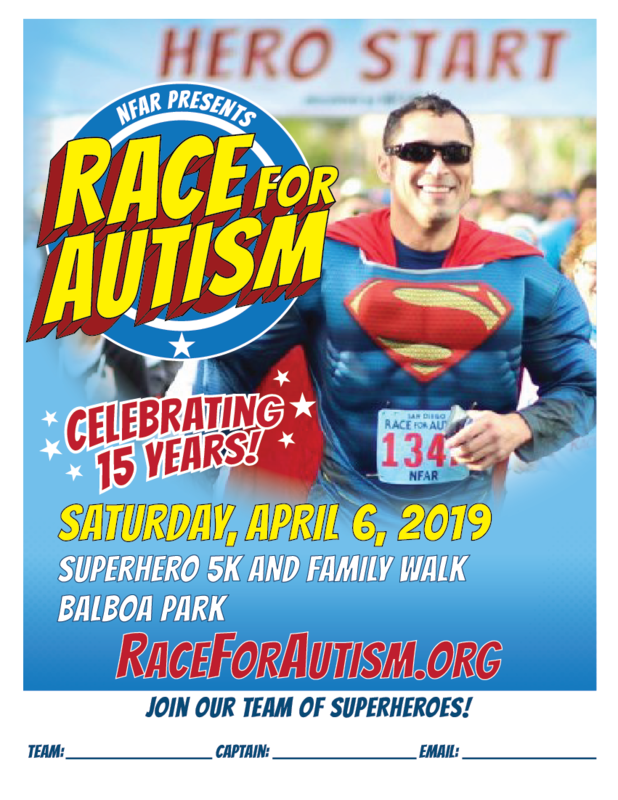 Help us bring the San Diego community together in supporting loved ones with autism. Share posters and postcards with your schools, businesses you frequent and neighbors. A caring and understanding community is better for everyone! Or if you would like some postcards and/or posters mailed to you, Contact us at 858-679-8800 or email us. Building a Team is fun, easy and a great way to enjoy the San Diego Race for Autism! We have provided you with some Team Captain tools and MAIL-IN FORMS. Check out the Team Information page for team materials and information. Please consider asking friends and family to support you as you run/walk. While not required, it makes a big difference in the number of autism programs we are able to support in our community. FUNDRAISING TIP: If you don't ask, they won't give. Many people are willing to give a few dollars to a cause that is important to you when asked. Please be use to include your name with donations mailed in so we may add them to your fundraising.